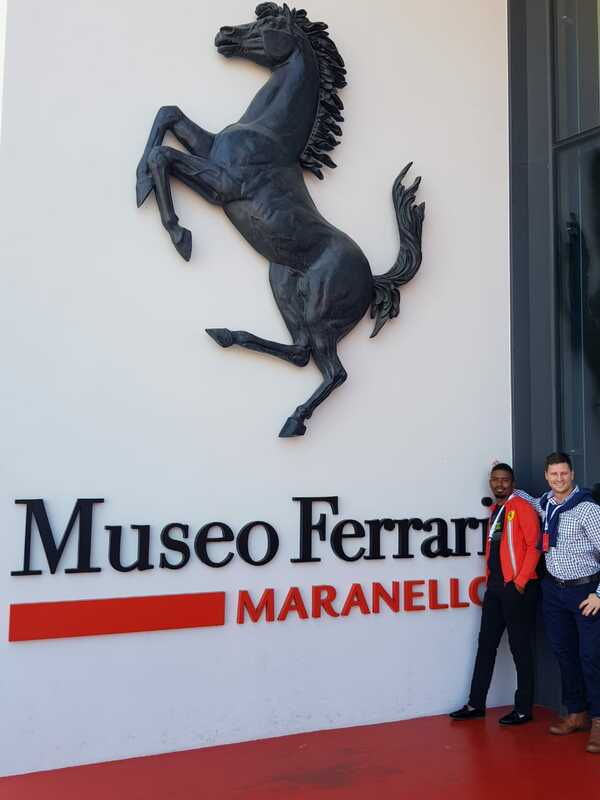 Our winners (Patrick Davids and Jandre Marais) of the all expenses paid trip to Maranello, Italy the home of Ferrari with Pablo Clark Racing, left on Tuesday the 19th March and returned on landed back home on Sunday 24th March. Patrick Davids gave as an outline of what happened below and what we all missed out on. I find myself pondering and asking myself, did what I experienced really happen? Really, really, did it really happen? 19/03 – OR Tambo, I caught a flight to Paris (not anything like catching a Taxi), the excitement bubbling over. From Paris to Bologna, all I can think off is schucks – this ain't a dream anymore. 20/03 – We land in Bologna. Paolo (Pablo Clark Racing and ITOO) and Justin (ITOO), waiting for Jandre and I – But to our awesome surprise we met 10 more of the most amazing people. As we head out to the shuttles, the guys marvel at a couple Lamborghini's parked at the airport – I could have written them off there and then, but luckily – I’m a cool chap. We checked into the Planet Hotel – I open my curtain and boom – The F1 factory right in my face – SMILES ALL THE WAY. 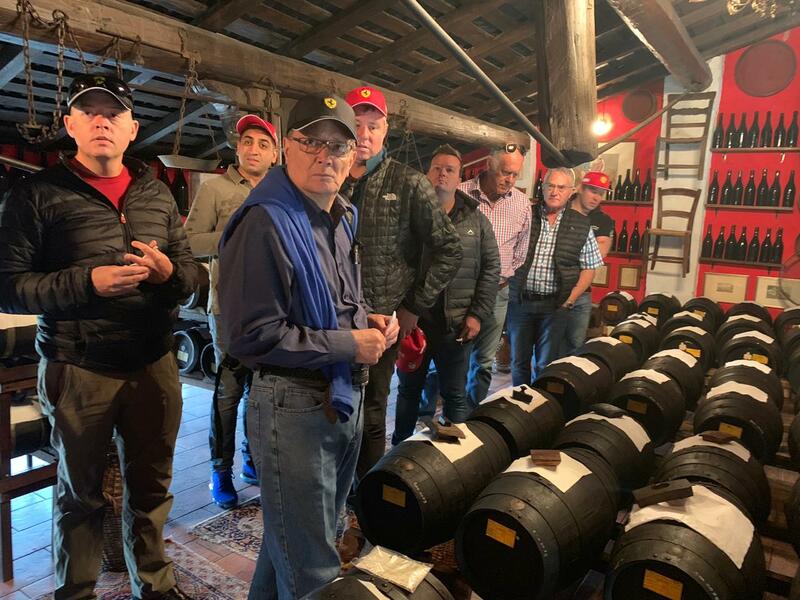 We went to a nearby town, Ricco, and had lunch there – I realized that this trip will be all about fine dining, Lambrusco wine and great conversation. Fast cars, slow-food and great company was the order of the day. Later that evening we went for a quick practice in the F1 Monza GP Simulator – and boy oh boy- what a jol. But to top, that evening off was dinner with a very special guest, Mr Rory Byrne, South African born Chief Engineer of the F1 Cars. In fact, Mr Byrne designed all of Ferrari cult hero, Michael Schumacher’s F1 cars. I nearly cried. We ended the evening with a stroll to the Hotel and a lekker Ice cream. 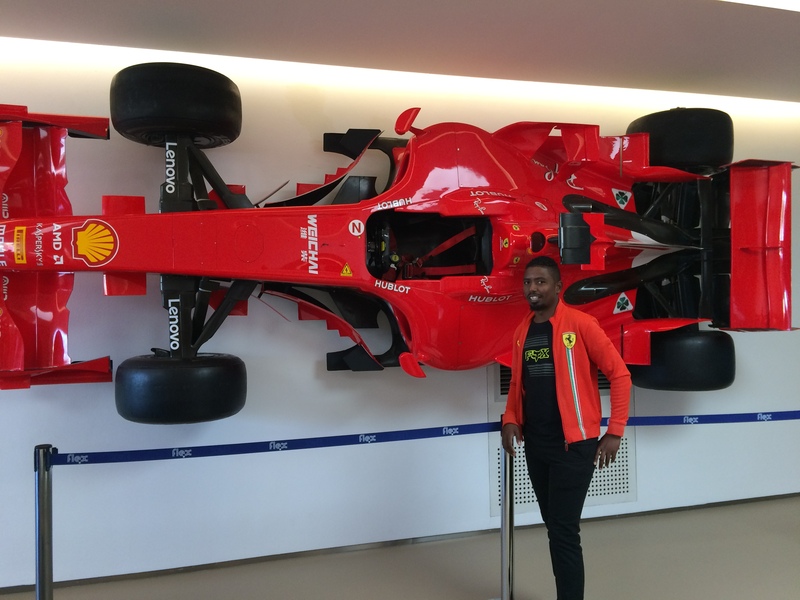 21/03 – We went on tour in the Ferrari factory, where before my eyes I saw my dream come to life. I Think there were easily between 50-70 Ferrari 488GTS’ and Portofino’s being built. To see that process from start to finish was absolutely mind-blowing. The testing of the cars – That Roar is enough to make a Lion shy. What a thrill – I felt excitement OOZING out of me like a bottle being squeezed. We had lunch and visited the Pablo Pavarotti Museum in Modena. An experience that words will never do justice too. We visited a Parmigiano cheese factory, with cheese estimated at over R90 Mil – talk about winning the Lotto. We also had the privilege of seeing an ASTON MARTIN collection dating back to the early 1900s in mint condition. Some of which only 1 model has ever been built. Before dinner, we visited a world famous restorer of classic Ferrari's. I had never seen so many F40s in my life one of which I think will always be special to me because it belongs to one of my very dear friends whom I met on the trip. An F50, which stood in the workshop was started – I felt like a little kid who had just passed grade R – I was beside myself. I still have sweet dreams of it. 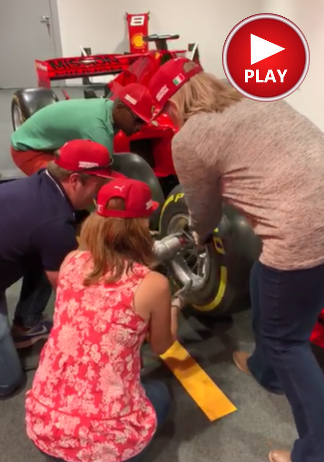 22/3 – Getting up in the morning was so easy because we’d be visiting the ENZO Ferrari Museum. A building designed by a Japanese architect which had a resemblance to the Sydney Opera House in Modena Italy was in itself a sight to see. We saw vintage collections – some of which only 1 had ever been built. We went to a body shop. I have seen skill, but what these guys did with a hammer and a chisel can only be described as ART. Getting the perfect line, building even a dash from aluminium with the precision that not even a machine can match. We went balsamic tasting – I will probably never taste anything close to that in Mzantsi – It was heavenly. Then my skills on the track got tested when we went go cart racing. I got the fastest lap, which had me in Pole position and it must have been turn 7 – I lost it all, as I span off the track. I was full of dust and last. I would go on to spin 4 times more on turn 2. Needless to say – I was last. We ended the day off at Da Danilo a restaurant in Modena, after enjoying sometime in the city center, admiring the beautiful historic buildings. Then came the day most of us waited for, the day we had all been waiting for the day that would make some of our life long dreams come true. 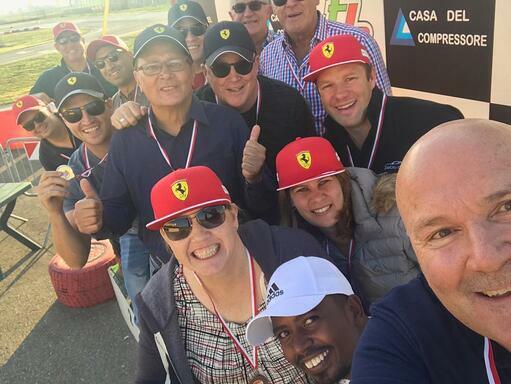 My moment – I got into a Ferrari GTC4 Lusso – V12 engine 4 Seater (The Most Expensive Road Ferrari) and I start the engine – Contrary to popular belief, that V12 was as silent as a lamb. 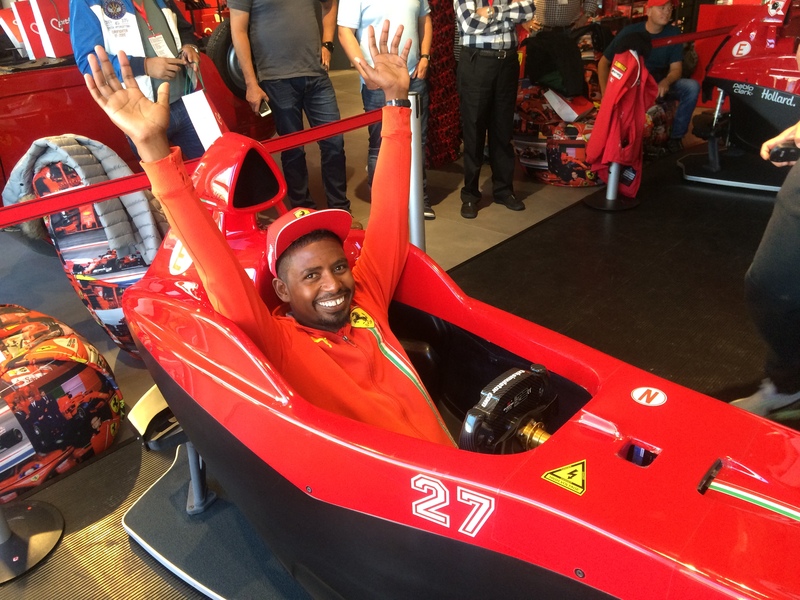 Nervous at the price tag, coupled with driving on the wrong side of the road (Right-hand side), plus the emotion of driving the worlds #1 Brand, A Ferrari. A slow pull out of the parking lot, and a cautious drive down the road. A bit of traffic and pedestrians reminded me of how I felt when I got my license. I get some space and accelerate, all of a sudden, the lamb becomes a lion – Rooooooaaarrr… and as I slow down so the lion becomes a lamb. I drove up into the hills on narrow roads, too scared to look around, my eyes are fixed on the road. Halfway through and we swop cars. I get into the 458 Italia Spider, boasting a V8 mid-engine. There was nothing silent about this one. Her appearance alone tells of how feisty she is. I feel a tear rolling down my cheek, and before anyone could see, I wipe it off. The instructor next to me gives me the green light and off we go. I get an immediate straight, no traffic and a heavy Foot. My foot pushes the accelerator deep and that 458 Screams with pleasure, all her pipes are open – ROOOOAAAAAARRRRR- - - - - - purp purp purp. She responds like an obedient child. The g-force pushes me into my seat and my cap barely holding onto my head – the instructor impressed and my heart – Shew – I had never been so happy to have traffic in front of me cause she just wanted to go faster. So I slow down, give the little cars ahead of me a head start, cause the beast I was in wanted a meal. After I had +- 400-500 meters between myself and the car ahead of me – FLAT FOOT - ROOOOAAAAAARRRRR- - ROOOOAAAAAARRRRR- ROOOOAAAAAARRRRR- - - - - purp purp purp and within seconds I’m caught up. 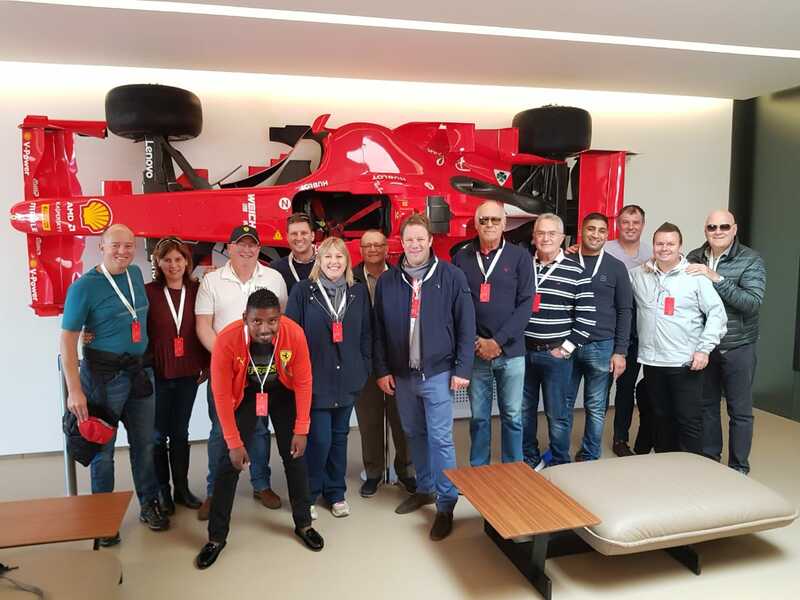 We get back into town after our little excursion and we drive down ENZO Ferrari lane – A feeling that I had never felt before came over me like a low cloud on Table Mountain. I was IN AWE – COMPLETE AWE. Thank you, LORD, was all I could manage. I got out of the 458 – and I could not help myself but scream so loud, that passersby were excited with me. Another tear rolled down my cheek – I made a vow right there - I WILL OWN MY FERRARI! We had lunch – the hype all around the table. We received trophies and Marike and Tracy the 2 ladies on the trip, won the prizes for the Engine rebuilt – they were super impressive. The sad moment of having to say Good-Bye to people whom I met 3 days before, felt as if I was leaving my family behind. We shared great stories and built lifelong relationships. EASYEQUITIES – My partners in building wealth. ITOO – Through whom my Ferrari will be insured. And my fellow WINNER – JANDRE.